The object of Red Nova is to tilt the screen so that the red square will travel until it hits a wall and then eventually go into the black hole. There are 40 levels. I did the first 20, which were free, in about 20 minutes. This Puzzle App Correspondent has seen this type of puzzle at least 25 times. 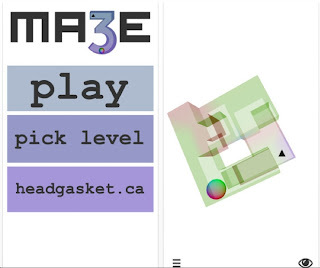 Ma3e is a free tilt-maze puzzle game app. The shapes are not necessarily cubic. I played 2 of these levels, it's not quite my thing. But there is a a definite element of fun. Bored comes from Patrick Q. Kelly. Fans of Lunar Lockout and Pike's Peak need no explanation. The object is to send your man to the center without falling off the board. A man can travel vertically or horizontally, until it hits another object. Solution for the Nickel: move nickel to the left. Move the top left penny to the right, then down. Then move the nickel to the right. 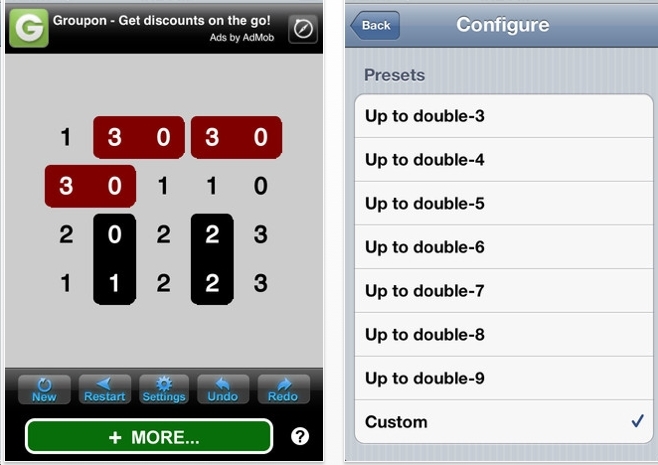 There are 5 or 6 different backgrounds to choose from. I like the coin one. There are 520 levels. Seemingly, they are all unique. But that's not exactly the case. #75 & #90 are virtually the same. I did the first 100 levels in about 20 minutes. Then I did the last 20 levels. All of the levels are kind of easy. I was looking for a serious, fun challenge. 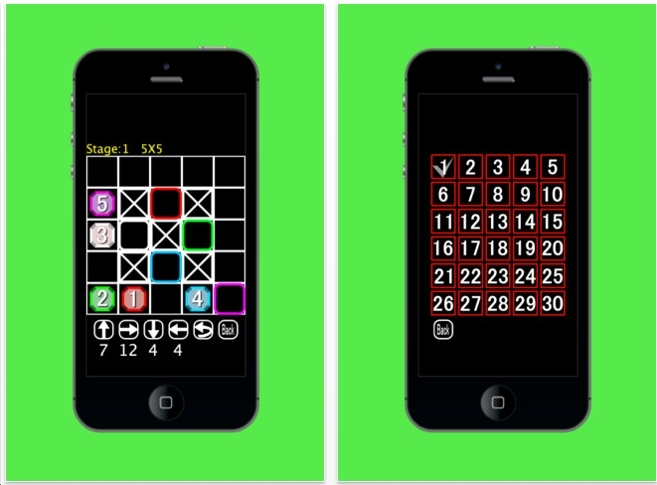 Unfortunately, this is really for casual puzzlers. 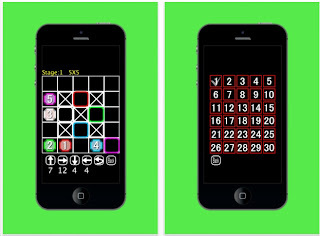 TetragonoS is a free puzzle game app that's similar to sudoku and Latin Squares. You are given a Latin Square: each row and each column has different numbers. 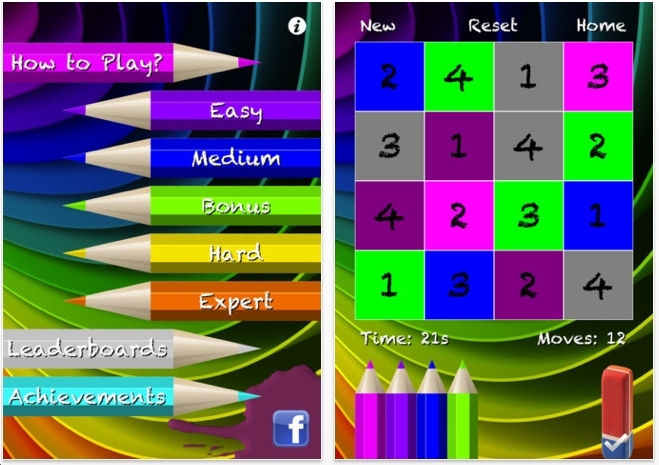 You must color 4 tiles blue making sure that each blue tile gets all 4 numbers. 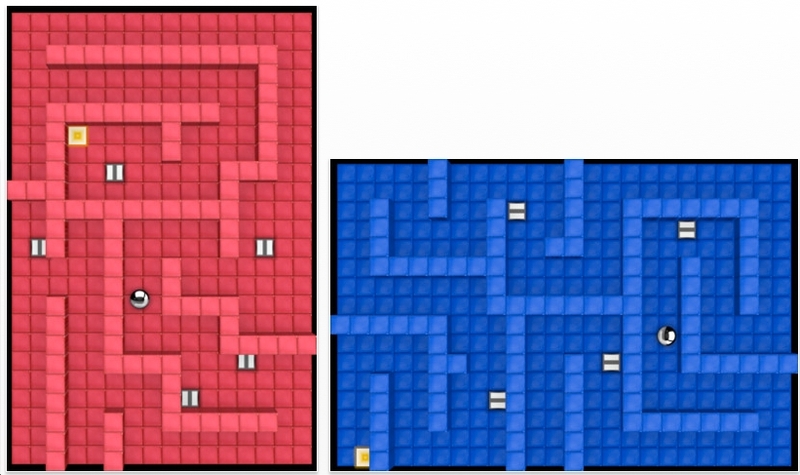 Basically, you can't have two blue tiles using the number 3. Click here to see the Maestrosities pilot tv show. About 6 weeks ago I saw the premiere which was about 24 minutes and quite funny. Rod Kimball, who is a juggler and puzzler friend is in the band. He is also a member of The Flying Karamazov Brothers. iCube is a set of 3D cube mazes from UNNYHOG. They also made Lookout Blizzard, which I happened to love. 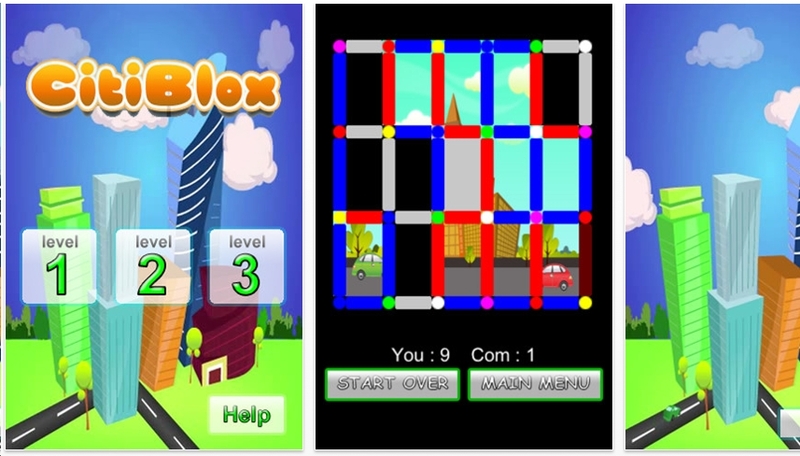 There are a series of 3x3, 4x4 and 5x5 cubic mazes. Roll the ball to the end. 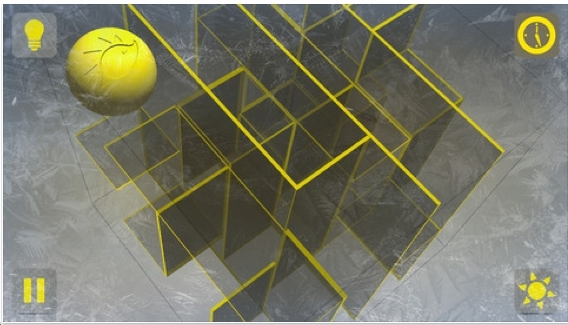 Over the years, there have been numerous cubic mazes made in physical form. iCube does an admiral job of showing the ins and outs. In the past, I decided not to purchase some cubic 3D mazes because it was too difficult to see through so much plexiglass. 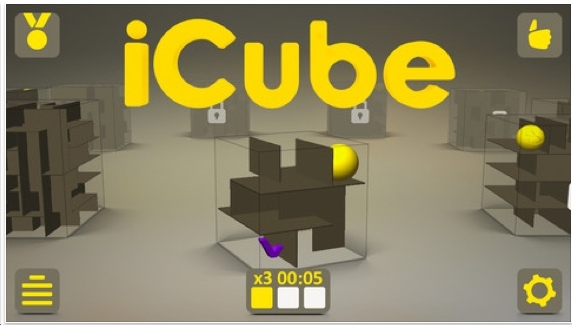 iCube incorporates a very good shading system for the walls that makes the puzzles quite doable and not frustrating. The free version has 9 easy puzzles. I've solved them all. The paid version has 81 levels. Pavel Ignatov is the puzzle designer. No idea if he's related to the famous juggler who first juggled 11 balls. Happy Thanksgiving to everybody. See you on Monday. Also, if you're a regular reader of this blog, please sign up as a follower. 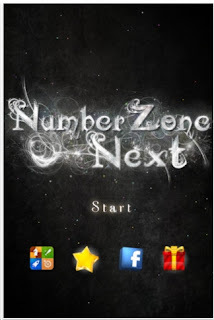 Number Zone Next comes from Hideaki Hashimoto who created the original Number Zone, which is another good puzzle app. The object of Number Zone Next: some of the balls have numbers. Tap on one of them and swipe that number of balls to make them disappear. Number Zone Next has 100 levels. I did the first 20 in about 10 minutes. Then I jumped to the last section of 20 puzzles. I'm stuck on #88. These are tough, fun, and hey, free! Number Zone Next quite possibly makes it onto the list of Best Puzzle Apps of 2012. That list will be released on December 31. The excitement is brewing. Anti Virus: free puzzle game for all computer users! Raf Peters contacted me recently about Smart Games' new set of on-line puzzles based on their board-game puzzles. Raf designed the concepts and challenges for most of them. This weekend, I play-tested Anti-Virus. It was designed by my puzzle friend Oskar van Deventer. The object is to slide the pieces around, along the grid lines to get the red piece out at the top left corner. The concept is similar to Rush Hour. But the pieces are weirder. There are 120 levels. Of the 30 Expert levels, I've done 27 of them. The image here is one of the ones that has me stumped - temporarily. See the white dots? Those pieces cannot be moved. 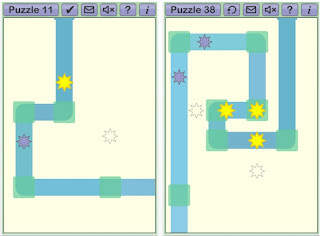 Raf tells me that all of the puzzle games have been designed using HTML5, which means that you can play them on any computer. Even on ipads. I'm hoping they appear as apps later on. One more thing: about 6 months ago, somebody actually published an exact copy of Anti-Virus on the App Store. 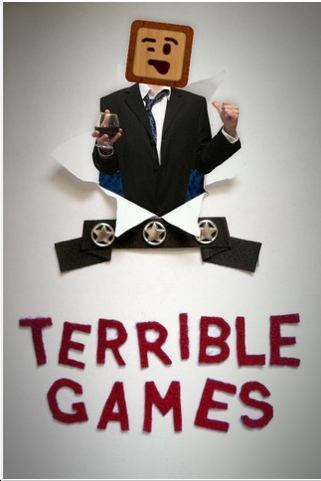 Naturally, I alerted the Smart Games people and their legal department took care of it. Years ago I used to buy Dell's Math & Logic Problems. It came out sporadically, maybe every 2 months. They had a domino puzzle just like Dominosa Free. The object is to put the dominos to match the grid. 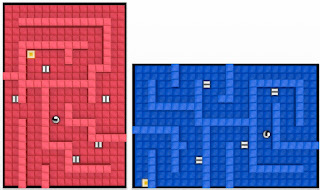 In the diagram, notice the 3 red tiles? They're red because only one of them can be 3 - 0. 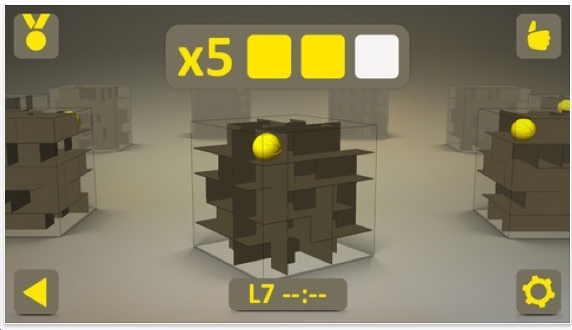 Dominosa Free can generate an infinite number of these puzzle at much harder levels than the one pictured. 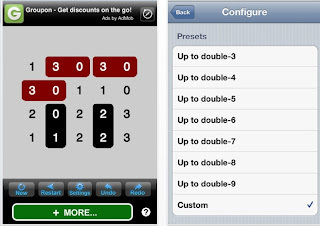 Does this make it onto the list of Best Puzzle Apps of 2012? No. But it's still good. Ryan Gorer has developed a most interesting series of puzzles. You are given a pipe with a star on it. You must slide the pipe and bend it so that the star lines up perfectly on the blank star. That's the easiest level. On the harder levels, your pipe will have multiple stars. There are 100 levels. I've done 33 of them. Some of them are quite tricky. One qualm I have with this puzzle: suppose you tap on the pipe to bend it. It may bend to the right instead of to the left. If that happens, double tap on the joint and hopefully it will unbend and then bend in the direction you really want. That part is clumsy. 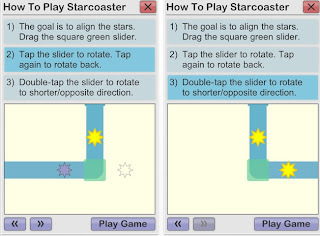 Starcoaster is a novel type of puzzle that could make it onto the list of Best Puzzle Apps of 2012. 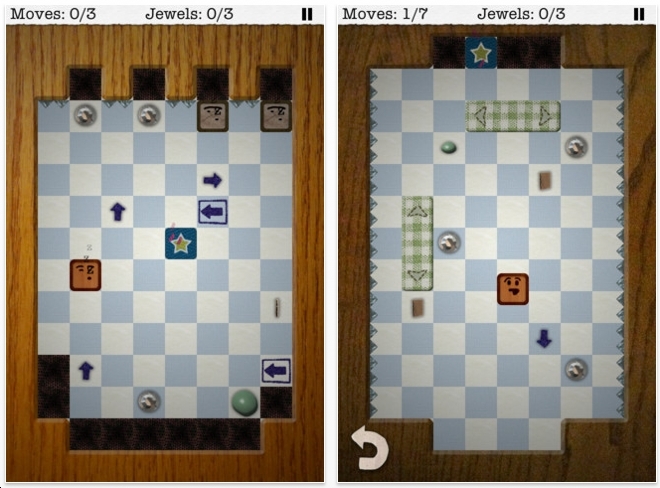 Cross Caps is a hexagonal peg-jumping solitaire puzzle. 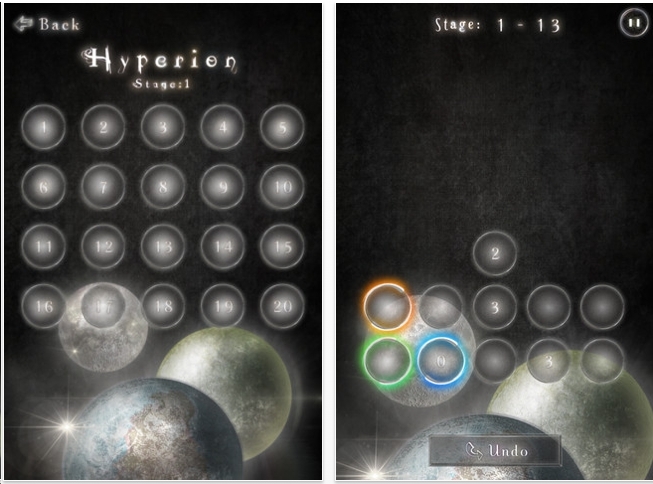 The free version has 20 levels. Not hard at all. What's a little weird is that all the jumps are taking place on an imaginary hexagonal grid. And yet, the background is a square grid. 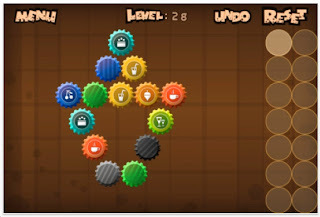 The full version has 35 levels. Unites is a shunting puzzle. The object is to move the red 1 into the red square and the green 2 into the green square, etc. 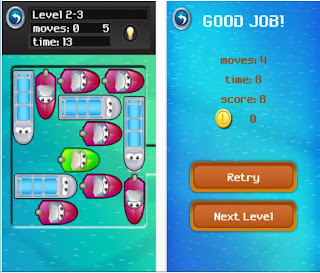 At the bottom of the screen you are given a limited number of arrow moves to go up, down, right & left. 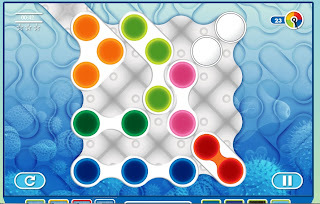 Squares that have a white X: no piece can go inside. Unites comes from Japan: when you solve a level this message pops up: "Clear. Next, does it progress?" Click okay. The puzzles are supposed to get progressively harder, but that's not exactly the case. # 29 & 30 were easy. 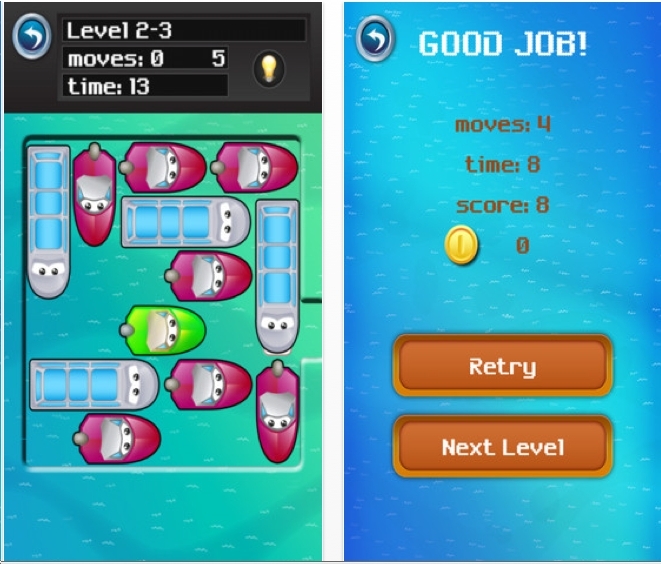 Another problem: you cannot clear a level unless you've used all of the arrows. I solved a bunch by using fewer. Then I had to use the rest up to 'clear'. This could be a really challenging set of puzzles. I'm hoping the next version will be better. 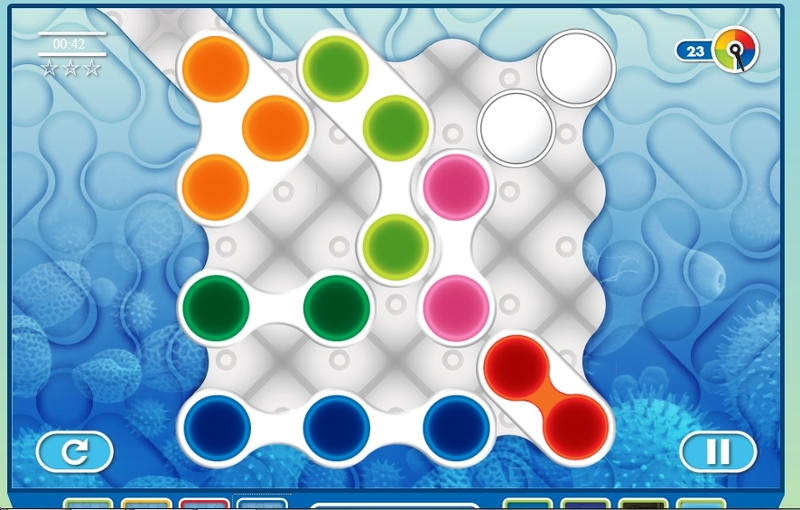 There are 30 puzzle levels. I've done 25 of them. Seems like every week there's another ripoff of Rush Hour. Magma Mobile is responsible for this one. They have another ripoff called Car Valet. 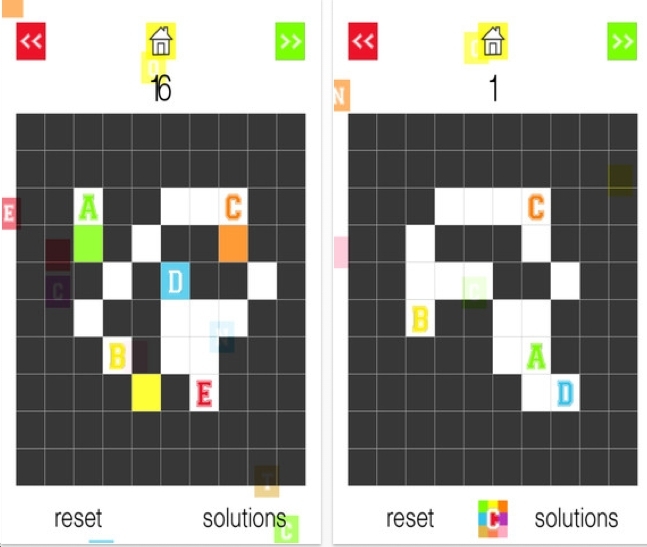 The Lite version contains all new puzzles, and the full version is also getting an update which includes those new levels. 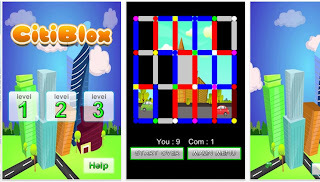 CitiBlox comes from AdAir Mobile. 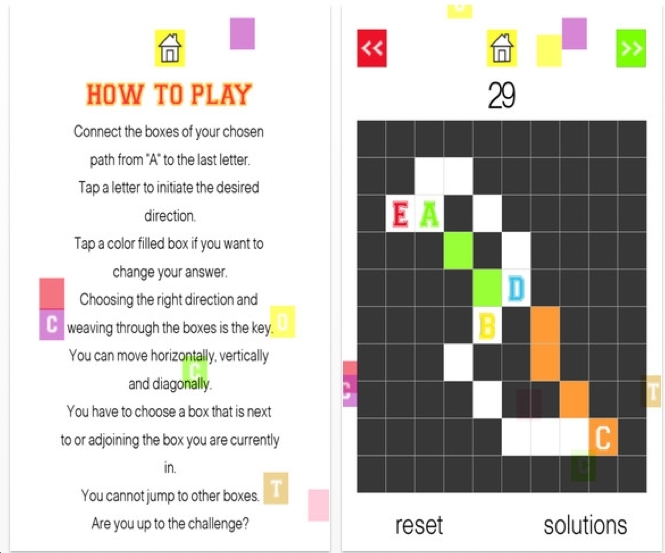 The game is virtually the same as Dots and Boxes. The object is to complete more squares than the computer. Completing a square means that you have tapped on the 4th side. It doesn't matter if your opponent tapped on the other 3 sides. Completing a square gets you that point. Before you move, the computer is already blinking his next move. That's a little weird. Notice the different colored dots at the intersections? I have no idea why they exist at all and if there is any significance to them being various colors. 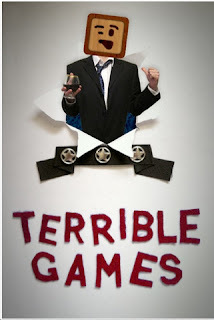 If you win the game, the hidden image is revealed. I've played the game a few times. It's okay. When I was a kid, my mother bought us several dexterity maze puzzles. Challenging and fun. Recently, the developers at http://tiltball.com/ sent me a promo code to play test their game. 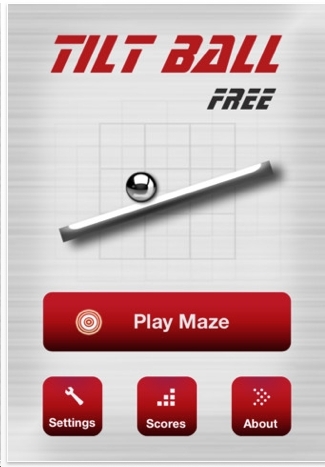 Tilt Ball Free has 100 levels. I've done about 75 of them, including the last 25. I did them on the easy settings where the ball doesn't roll too quickly. Tilt Ball is definitely fun. I think it's geared more for younger puzzlers. Magnets Puzzle Free is the name of this free puzzle app game from Wiseguy Sharp LLC. The object is to place magnets into the slots and orient them correctly. A + can never be next to a +. Also, the numbers on the sides indicate how many +'s and -'s exist in that row or column. 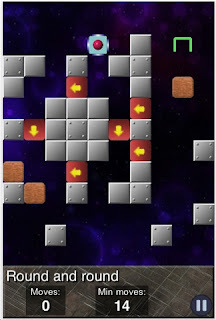 Tricky: some rectangular tiles will have no magnets at all. I've played this game only on the easy level to get the hang of it. It's interesting. I'm not sure, but this type of puzzle may have been originally published in Japan. Swisch is a series of 80 tilt maze puzzles. You are the red circle and your object is to get inside the green U. I have done so many Tilt-maze puzzle apps, that I've completely lost track. Swisch has lots of extra features, most of which I've seen before: wormholes, arrows that force your direction, unlocking doors, etc. Interesting feature: the wooden blocks need to be hammered twice before disintegrating. I don't think I've seen that feature before. This is quite interesting. The 80 levels: 11 training levels. 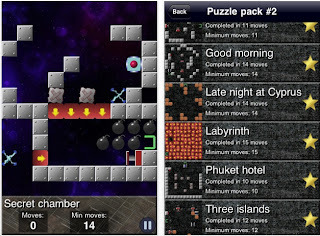 Puzzle Pack #1 has 25 levels - kind of easy. 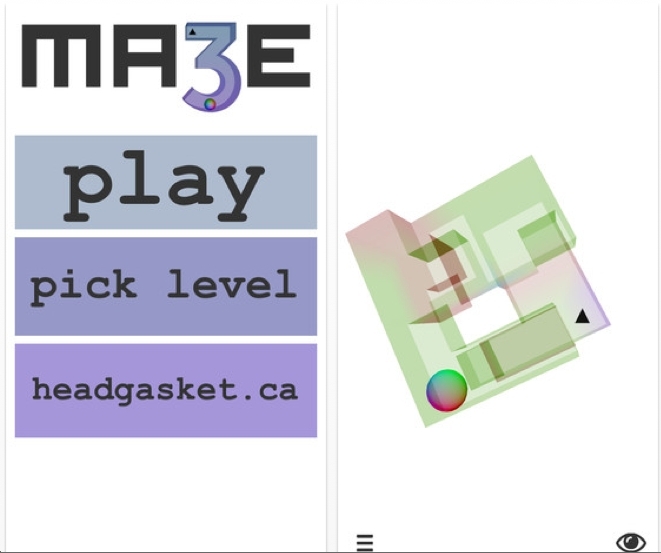 Puzzle pack #2 has 33 levels. 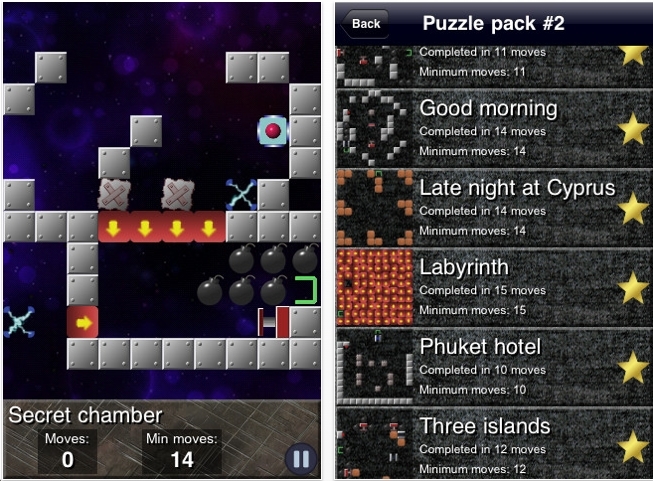 Puzzle pack #3 has 11 levels - they are tough! I have solved them all. 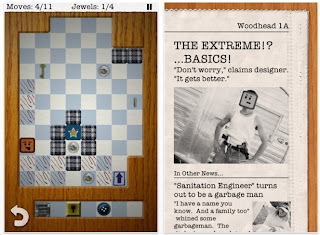 Does Swisch make it onto the list of Best Puzzle App Games of 2012? Quite possibly. 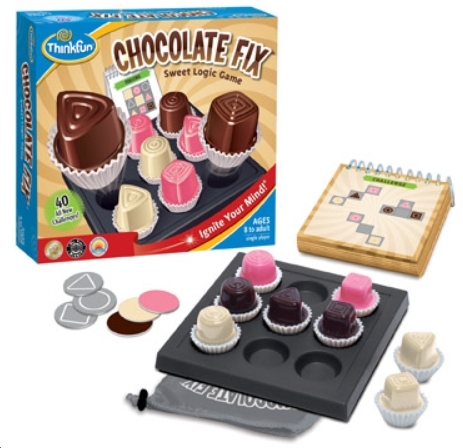 The smart kind people at ThinkFun sent me a promo code to play Chocolate Fix. Like many of their puzzle games, there are easy, medium, hard & expert levels. 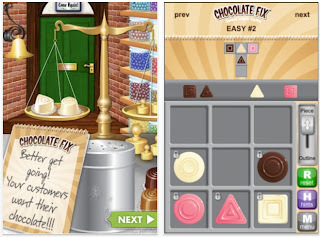 You are given clues about the arrangement of the chocolates: brown, pink, white combined with circle, square, triangle. These puzzles have to be solved with a little trial and error. So far, I've done all 100 medium levels. That was to get my feet wet on this concept. I've done 12 of the hard levels and 10 of the expert levels, including. For good measure, I did the last 5 of the expert levels. 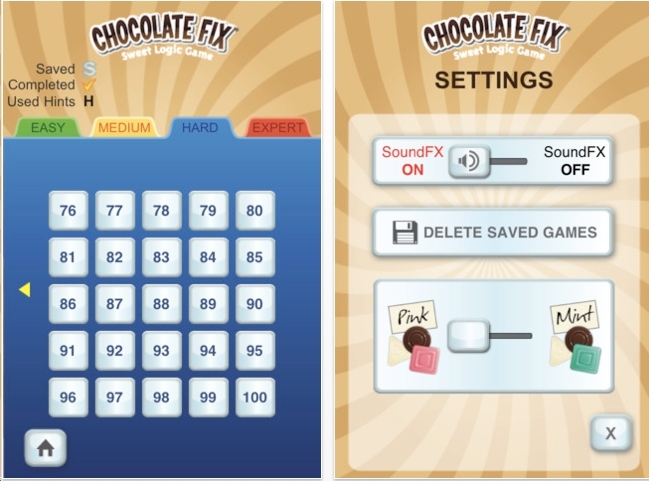 Bottom Line: Chocolate Fix is fun, challenging and quite unique. There's no way I'm going to finish all these by the end of the year. The hard and expert puzzles are time consuming. Check out the image of the physical version of this puzzle. You get 40 puzzles. I believe these 40 puzzles are completely different from the ones on the app store. 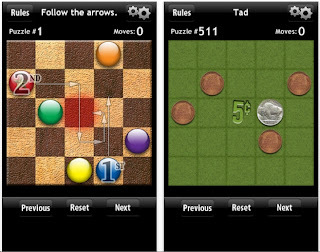 Other ThinkFun puzzle apps to play: Solitaire Chess & Rush Hour. Connect! 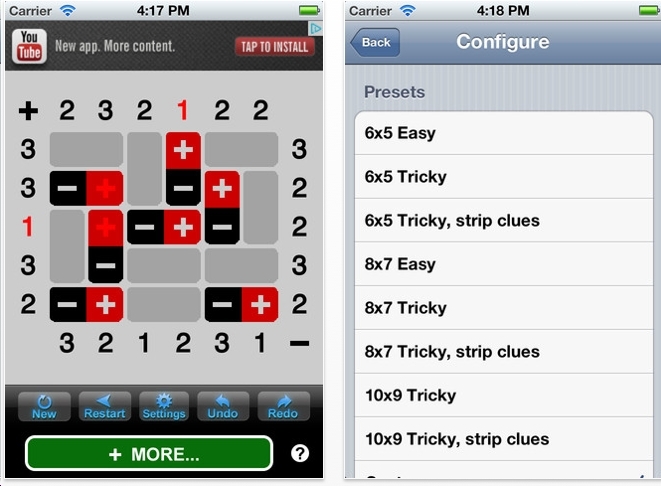 is a topology type puzzle app. 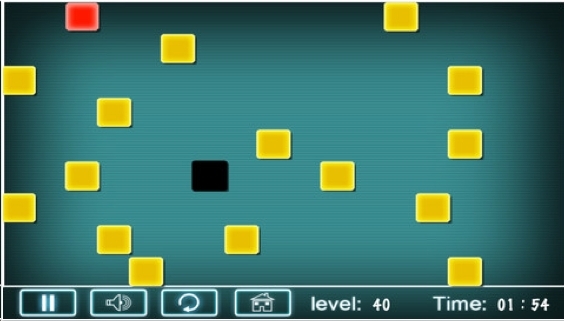 The object is to connect a path from A to the furthest level. Your path may go horizontally, vertically, diagonally. You will probably have to zigzag. 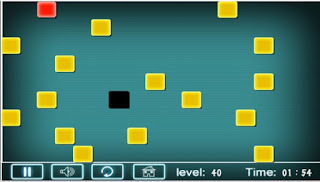 The first 40 levels are free. And they're easy. 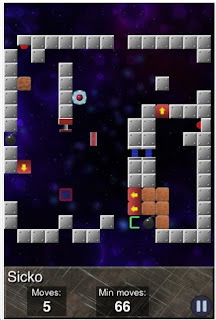 But the next 120 levels are harder and cost $1.99. Right now I've solved about 130 levels. The puzzles are not very difficuly. But they're fun and perfect to play when 'watching' tv news shows. I'm saving the rest of the levels for the Tuesday night's election. Sidenote: recently I was called on the telephone to ask my opinion about the election. However, I was automatically disqualified from answering because, as a blogger, I influence other people.